I miss you guys! I miss releasing new DoD episodes! Lucky me I still get to interact with the characters as I work on the sequel. I'm toying with the idea of releasing an excerpt from the still unnamed DoD 2. Is that something that might interest anyone? Email me or leave me a comment here, if you'd like. I'm also thinking of starting a question and answer series about Dreaming of Deliverance or anything: writing, narrating, whatever. Craig had a question about the end of DoD, that I'd love to share with you all. And if anyone else had questions I'd be happy to answer what I can: as long as it doesn't spoil what's coming! But if you'd like to hear me read something new, that's available right now, I recorded a story written by Kenn Crawford and his grandmother Hannah Crawford, that's now live at Kenn's site. It is beautifully written and very moving. The story behind this story is almost as touching as the story itself. So be sure to check out "Steven's Song". And I was interviewed for Podioracket's Blog Talk Radio show! It was so much fun and there were lots of good questions. If you missed it and would like to hear it, here's a link to the archive. During the interview, someone told me they liked reading about the Africa trip. I still have lots of pictures, so here's a new one for you! 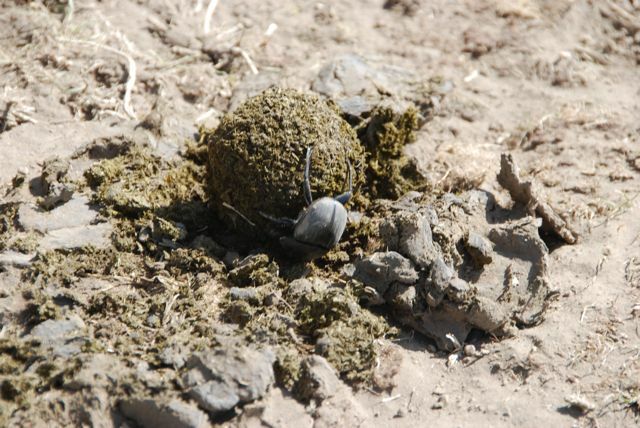 A dung beetle! Not the most picturesque of the African animals, but really when you think about it, they are pretty impressive! Finally, I'm supposed to mention that I was nominated for a Parsec award: Best New Speculative Fiction Podcaster/Team Apparently that's the kind of thing that one should blog about. I'm very humbled and thankful that someone thought of me for this category. So thanks to whomever put my name forward. There's more coming, and I will try to be better about letting you all know about it. I'm going to be doing some voice work for the Dunesteef Audio Fiction Magazine, as well as for a couple of podcast novels. I will keep you posted on the progress there as the release dates for those projects get closer! Take care, everyone! Thanks for sticking around. Even though DoD is over, there is more to come!